This 3-5/8" big bore kit may be used to replace the cylinders and pistons of an S&S SH98 engine or a stock HD® shovelhead engine that has been upgraded with an S&S 98" Sidewindert® kit. Stock crankcases must be bored to accomodate the 3-5/8" bore cylinders. 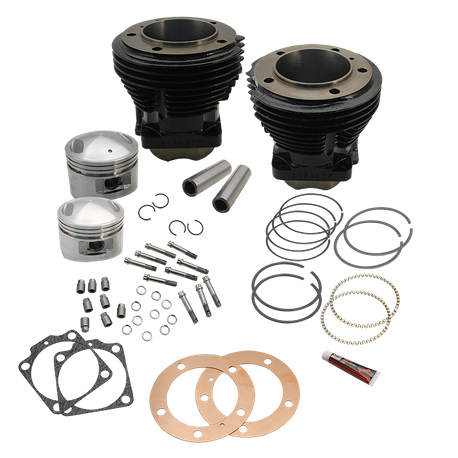 The kit includes S&S 3-5/8" bore cylinders, 3-5/8" bore forged pistons with rings and wristpins, head gaskets, base gaskets, exhaust gaskets, and instructions. Compression is 8.9 :1. The cylinders are longer then stock , so longer pushrods, and manifold must be used.